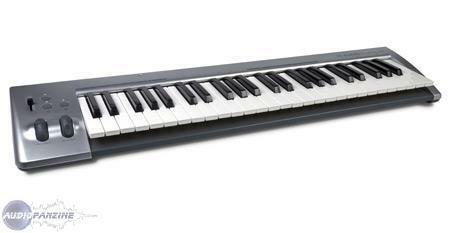 Key Rig 49, 49-Key MIDI Keyboard from M-Audio in the Key Rig series. "Does its job fairly well!" " Very good MIDI keyboard!" 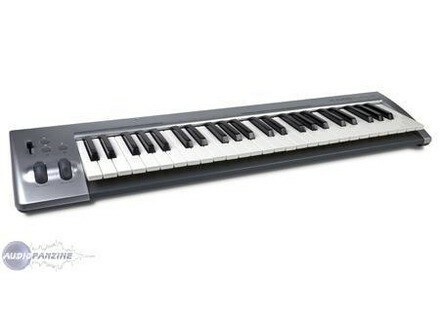 " Good product, simple and without headaches"
I used M-audio Keyrig 49 with cubase 5 in a Windows 7 PC. The Keyboard has velocity sensitive keys. I personally like this keys for playing synth instruments rapidly. It has no advanced function buttons. It has one slider, octave buttons. No faders, transport controls, knobs & pads. But it will suit for basic MIDI recording and editing. Only one disadvantage is the modulation and pitch bend wheel are sticky rubbery materials. Generally It is suitable for beginners as well as for advanced users.